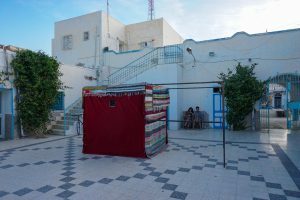 as part of the international SEE Djerba workshop and light & media festival from July 21st to August 4th in Houmt Souk, Tunisia. More: Pictures and video …. Thanks to the curators Aymen Gharbi and Bettina Pelz, thanks to the wonderful team of SEE Djerba, special thanks to Ingo Wendt and Eun-Sil Lee, thanks to Ursula Scherrer, Jan Ehlen, Julien Rathje, Ilona Rodach, Henry Cyrenius and all the artists and participants! How do we see? How do we perceive? Does art make you see differently? What are the cultural differences between the so-called western and the arab way of perceiving? The camera obscura effect has already been known in the ancient world, but it was the legacy of the Arab scientist Ibn al-Haytham, also known as Alhazen in the 11th century, to explain that rays of light travel in straight lines and how bodies reflect these rays, he did not use the term “image“ for what he called forms. In contrast the European artists and philosophers in the Renaissance used the Arab finding for their new concept of producing pictures, the construction of linear perspective. Furthermore they used the camera obscura as a metaphor of human understanding. The shape of the Djerbian Camera obscura relates to the Djerbian cubic architecture. Its small opening for the lens is linked to the small windows. While the window in the western culture is there to look out of the window, the window in the Djerbian house only lets little light enter the interior space. In the 21st century the Djerbian Camera Obscura Project wants to recall the relationship of light, space and perception and the very beginning of media art. 6 to 8 team members helped carrying the camera obscura from one place to the other. We asked passersby to go inside and provided them with informations about SEE Djerba. How it works: The lens in the Djerbian camera obscura room is mounted vertically in the sidewall. The brighter the opposite situation is illuminated the better is the live-image inside the camera obscura room, that can be seen inverted and laterally transposed on all sides, the ceiling and the floor. The projected image of objects outside the camera obscura in a distance about 15 – 20 meters is in focus. The lens was now and then replaced by slits or multiple holes, which formed the light and therefore changed the image.